The battle lines for the new Top 14 season have been confirmed with Toulouse set to kick off the defence of their title against Bayonne. Big spending Bayonne, who have recruited the likes of All Blacks winger Joe Rokocoko and Wales scrum-half Mike Phillips during the off season, will prove to be a stern opening test though both sides are likely to be missing a host of international stars due to the Rugby World Cup that will run along the first eight rounds of the campaign. Last season's beaten finalists Montpellier also face a baptism of fire against Racing Metro in Paris. 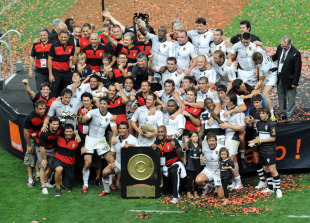 The opening weekend of fixtures, to be played on the weekend of August 26/27, will see Top 14 newcomers Lyon start their campaign away at Clermont Auvergne. Lyon will hope the experience of their two high-profile signings - former Springbok scrum-half Ricky Januarie and Argentine backrow Juan Manuel Leguizamon - will inspire a successful return to French rugby's top flight. Stade Francais, whose place in the Top 14 was only recently confirmed after they overcame their financial woes, will start at home against the recently-promoted Bordeaux-Bègles who will have former Northampton Saints fullback Bruce Reihana in their ranks for the new season. Elsewhere, big-spending Toulon begin at home against last season's Heineken Cup quarter-finalists Biarritz. Perpignan, who fell at the semi-final hurdle in Europe last season, will open against Castres while Brive, complete with former England international Shane Geraghty, face Agen. Click here for all the fixtures.